To load a view controller from a storyboard, call the instantiateViewControllerWithIdentifier: method of the appropriate UIStoryboard object. The storyboard object creates the view controller and returns it to your code. To initialize a view controller object using a nib file, create your view controller class programmatically and initialize it using the initWithNibName:bundle: method. When its views are requested, the view controller loads them from the nib file. Specify the views for a view controller using the loadView method. In that method, create your view hierarchy programmatically and assign the root view of that hierarchy to the view controller’s view property. 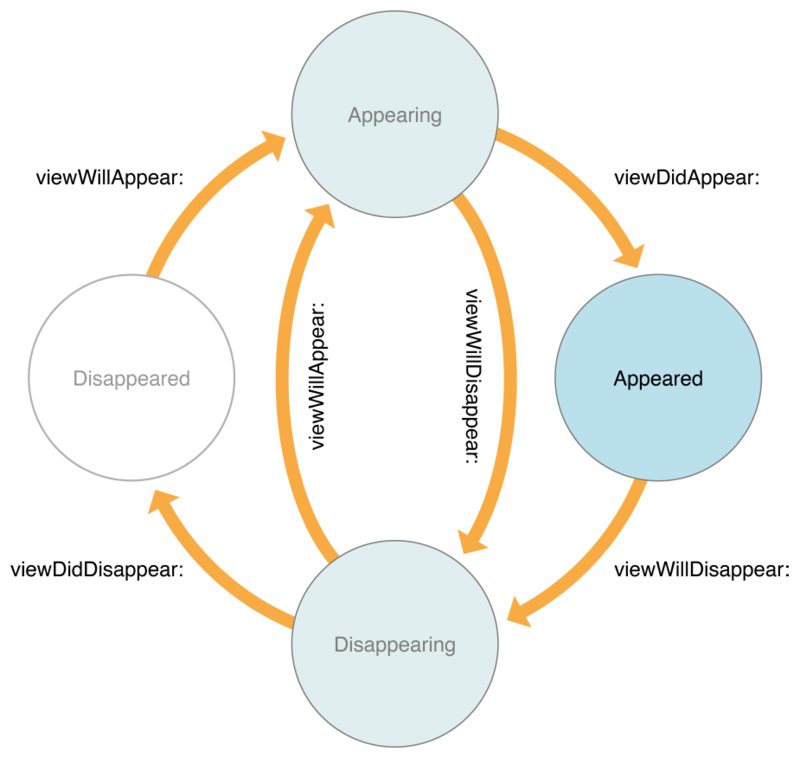 As of iOS 8, all rotation-related methods are deprecated. Instead, rotations are treated as a change in the size of the view controller’s view and are therefore reported using the viewWillTransitionToSize:withTransitionCoordinator: method. When the interface orientation changes, UIKit calls this method on the window’s root view controller. That view controller then notifies its child view controllers, propagating the message throughout the view controller hierarchy. When a rotation occurs for a visible view controller, the willRotateToInterfaceOrientation:duration:, willAnimateRotationToInterfaceOrientation:duration:, and didRotateFromInterfaceOrientation: methods are called during the rotation. The viewWillLayoutSubviews method is also called after the view is resized and positioned by its parent. If a view controller is not visible when an orientation change occurs, then the rotation methods are never called. However, the viewWillLayoutSubviews method is called when the view becomes visible. Your implementation of this method can call the statusBarOrientation method to determine the device orientation. At launch time, apps should always set up their interface in a portrait orientation. After the application:didFinishLaunchingWithOptions: method returns, the app uses the view controller rotation mechanism described above to rotate the views to the appropriate orientation prior to showing the window. By default, rotation and appearance callbacks are automatically forwarded to children. You may optionally override the shouldAutomaticallyForwardRotationMethods and shouldAutomaticallyForwardAppearanceMethods methods to take control of this behavior yourself. Memory is a critical resource in iOS, and view controllers provide built-in support for reducing their memory footprint at critical times. The UIViewController class provides some automatic handling of low-memory conditions through its didReceiveMemoryWarning method, which releases unneeded memory.